Sponge cakes… I definitely have the longest and strongest love-hate relationships with them. They’re not like macarons – macarons already have that level of difficulty there, so it’s kind of expected to not get them right the first time. 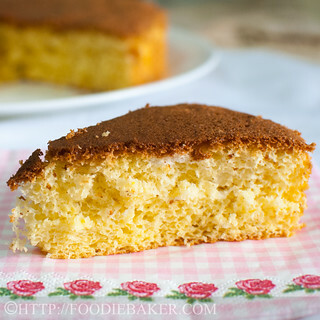 On the other hand, sponge cakes look so easy to bake, don’t they? Just beat everything up, fold them together, send them to the oven and you will get a soft, light and fluffy cake, perfect paired with tea or coffee. Looking back, I think I’ve probably flopped more than 10 recipes of sponge cakes – chiffon, victoria sponge, plain sponge… you name it – most of them probably made that list. However, I did bake a successful sponge, a delicious and delectable chocolate genoise, but that’s it. The chocolate genoise was the only recipe that I got right, but I knew I had to learn how to bake a plain sponge cake in the future, so the opportunity arrives when Mimi from MiMi Bakery House chose an Orange Sponge Cake recipe for The Home Bakers this time round. To be perfectly honest, when I knew that the theme is a sponge cake, I cringed and was pondering really hard whether to skip this bake. But that’s not very nice and I would just be giving myself excuses. So I tried and tried, and after 3 attempts, I got it – a soft, light and fluffy with a very teeny weeny hint of orange. When I saw it rose in the oven, I was dancing and twirling around the whole kitchen (just like when I saw my macarons grew feet); and when I sank my teeth into the cake – I closed my eyes and I swooned. Let’s move on to the step-by-step photos, shall we? 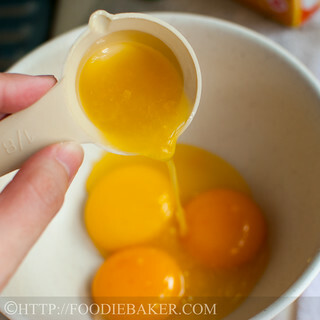 1) Grab 3 egg yolks 2) Add in some orange juice. 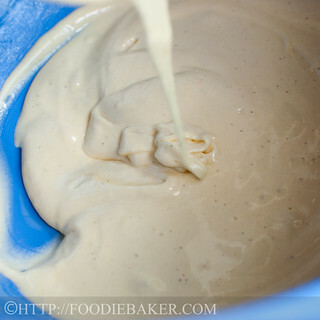 3) Whisk them together! 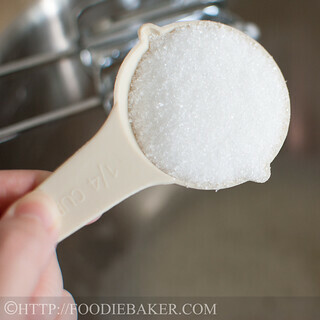 4) Weigh the sugar in a large bowl. 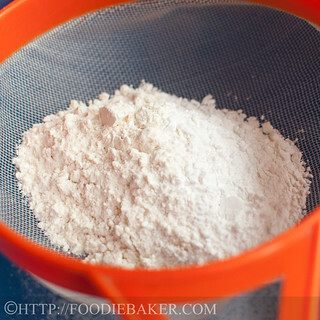 5) Weigh the flour, baking powder and salt and tip them into a sieve. 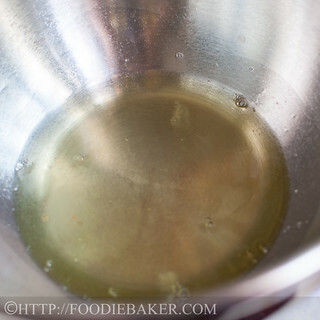 6) Sift the mixture over the sugar. 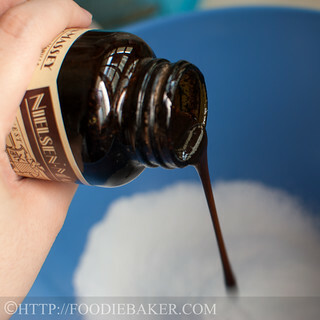 7) Add in a little vanilla extract / vanilla paste. 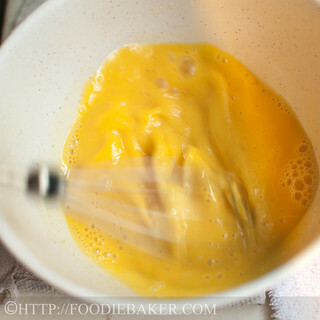 8) Pour in the egg yolks-orange juice mixture. 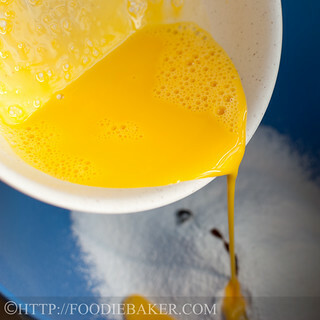 9) Whisk until the mixture is pale and thickened. 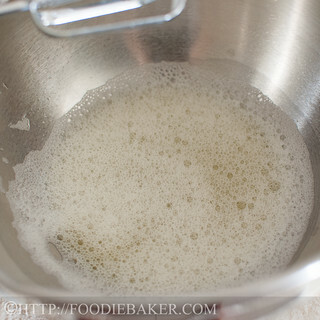 10) Place the egg whites in another separate bowl. 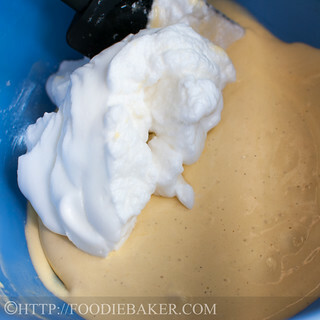 11) Beat with an electric mixer on medium-low speed until foamy. 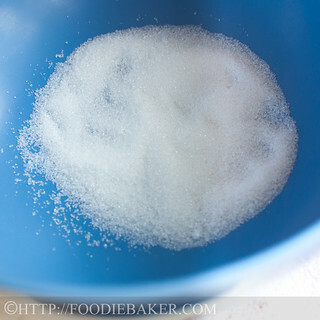 12) Add in sugar gradually. 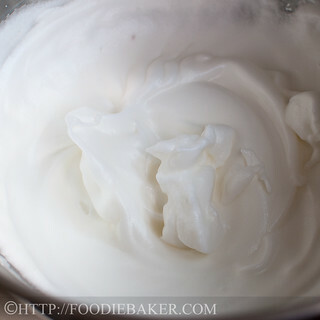 13) Until the egg whites form stiff peaks and are glossy. 14) Fold in the egg whites gently until fully incorporated. 15) Pour it into a cake tin. 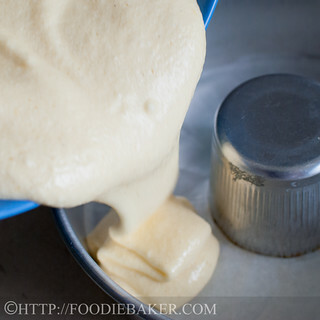 16) When the cake is done, invert the tin and let cool completely. 17) Run a knife along the edges of the cake. 18) Invert the cake out and peel off the parchment paper. I am submitting this to The Home Bakers, hosted by Mimi from MiMi Bakery House. Do check out all the other members’ bakes here! 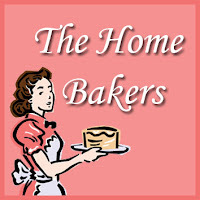 As part of the house rules for The Home Bakers, I’m not allowed to post the full recipe, so, for the steps on the recipe, please refer to Mimi Bakery House! 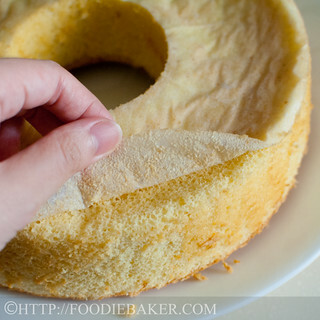 Since I cannot post the steps, I shall share some tips and notes that I’ve learned from my sponge cake making journey. Do note that these tips are mainly for beginners and those who have never attempted baking a sponge cake before. If you’re already an expert, you probably wouldn’t need all these! An 8-inch chiffon pans can range from 3-inch tall to about 6-inch tall. My chiffon pan is only 3-inch tall, hence I can only make 1/2 the original recipe. My chiffon pan is not those removable kind, so I lined the bottom (bottom only!) with parchment paper, but leaving the bottom and sides ungreased. 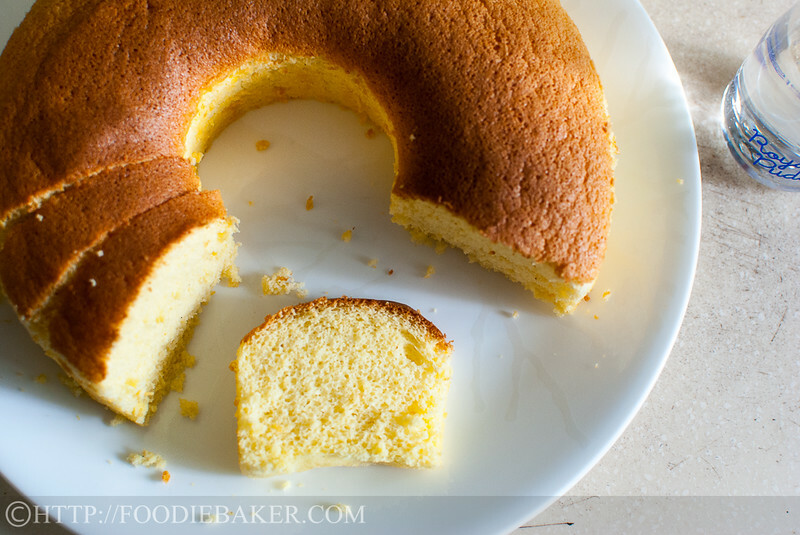 If you don’t have chiffon cake pans, you can also bake the cake in a normal cake pan, making sure they are at least 3-inch tall, and line the bottom with parchment paper. The cake will rise a lot during baking, so if you are baking them into individual cakes, fill the cake pans / moulds only up to 2/3 tall so that the batter will not overflow during baking. 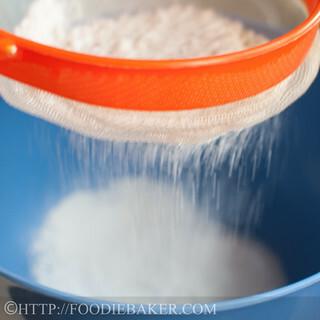 The original recipe uses cake flour – which yields a softer and lighter cake as compared to plain flour. Since I never have any on hand, I substituted it with a mixture of plain flour and corn flour. I omitted the orange zest (no oranges on hand) and used bottled orange juice instead of fresh one. There was a slight hint of orange taste that very few people can detect, so I guess adding the zest will help boosting the orange flavour more. The failure – see the large, uneven air pockets? Soft and very fluffy! Edit 6/8/2015: Sadly, the video is no longer available. I’ll see if I can video down my attempt in folding the egg whites, then upload it here! 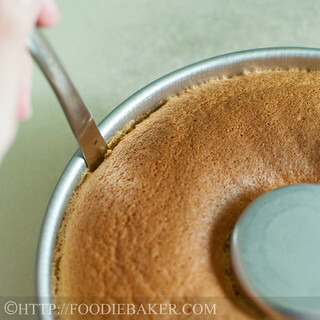 After transferring the batter into the cake pan, smooth the surface with the back of a spoon and rap the pan twice on the table counter to get rid of excess and large air bubbles so that the cake will rise evenly. Bake until the top is browned, the cake well-risen and a skewer inserted into the centre of the cake comes out clean. 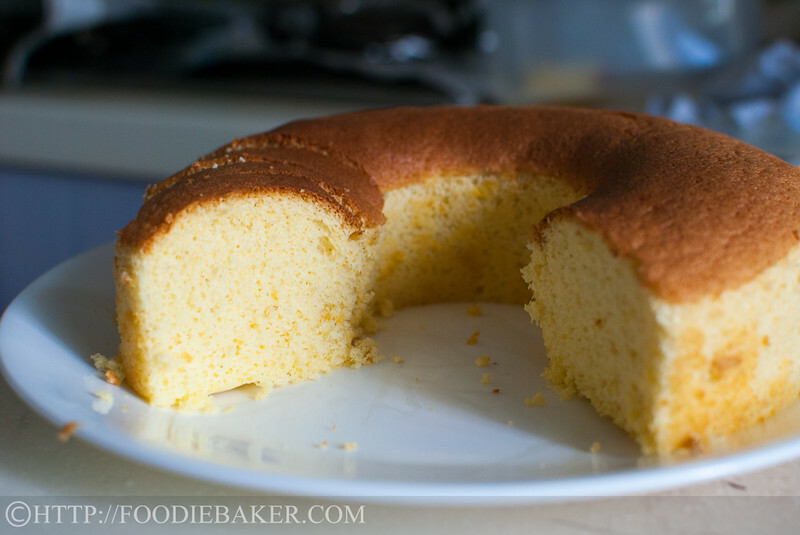 If you are using a chiffon cake pan, after removing the cake pan from the oven, invert the whole pan and place it over a glass / bottle etc. This prevents the cake from collapsing. 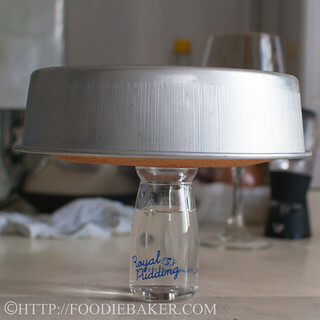 If you use a normal pan, invert the cake pan onto a wire rack. The sides of the cake will cling on to the cake pan so that it doesn’t fall out (the reason why you shouldn’t grease your pan!) If your cake rose so high way over the cake pan, simply let the cake cool in the pan completely before removing, it may shrink a little. 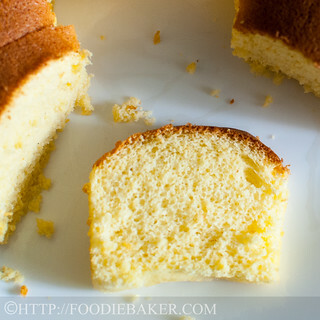 Use a knife or a spatula with a thin blade and run it along the edges of the cake carefully. Invert and it should pop right out, peel the parchment paper off and invert the cake back up again. And it’s done! It is nice to having your tips. folding egg white did give me headache but could not resist the attempt to bake again..
Hi! I know exactly how you feel! I have a serious love-hate relationship with sponge cakes. I hope the notes are useful! I still refer to them whenever I make sponge cakes…! 🙂 happy baking! What a beautiful bake Jasline. 3rd time lucky 😉 it looks so lovely and fluffy. as always, i love your very helpful notes, and not sure if it’s because I’ve been viewing your website through my rss, but i like the new step-by-step format pictures! 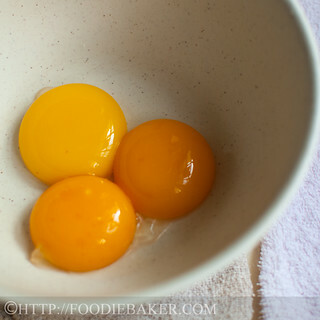 Wow look how bright orange your eggs are…. You are a little pro with the whisk. Gorgeous cake and with the orange I am sure it tastes just like spring. the chiffon sponge looks light and beautiful like how it should be! looks like third time is the charm. it’s great that you have a never-give-up attitude! What a delicate looking cake! That looks perfect to me. Nice and light and slightly fluffy. Do like the hint of orange as well as I’m not overly fond of sponge. Now *that*, Jasline, is the way to answer a challenge! You didn’t let a failure or two stop you and you ended up with a beautiful sponge cake. i don’t know if I’ll ever be brave enough to attempt a sponge cake but, if I do, I’ll surely come back here. Thank you for taking the time to document not just the steps but your tips for success. 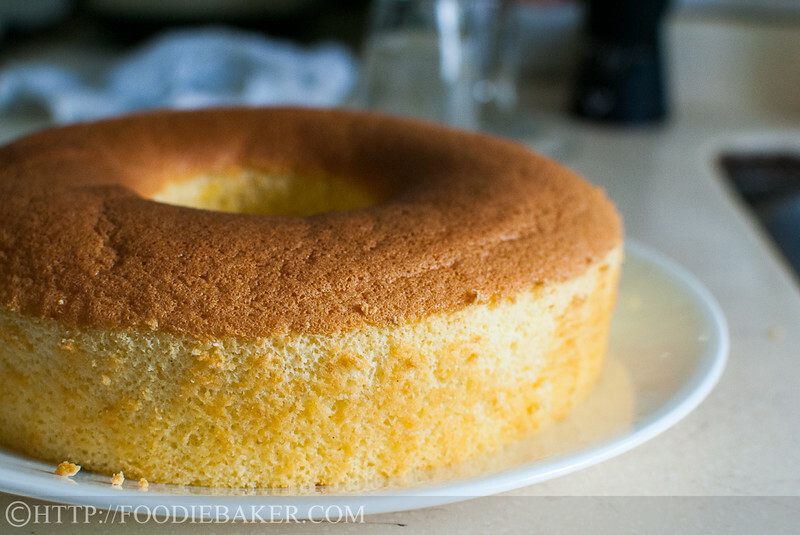 Wow…I admire your determination in creating a perfect sponge cake. The orange sponge cake looks beautiful. Congratulations on the beautiful sponge cake. It looks perfect. I know and sympathize at your plight after quite a few mishaps of my own but when you do get it right it’s a wonderful sense of accomplishment. Your sponge cake bakes up gorgeous! Looks so spongy and fluffy! I’m glad that you did not give up so easily! Yay!